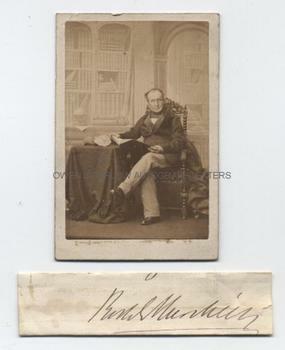 SIR RODERICK MURCHISON Autograph Signature with Photograph. Sir Roderick Impey Murchison, 1st Baronet. British (Scottish) geologist. The first to classify and name the Silurian system of rocks. 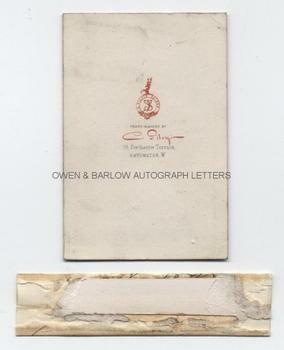 Autograph signature cut from the foot of a letter and mounted on card. Together with a rare photographic portrait of Roderick Murchison by the French photographer Camille Silvy. 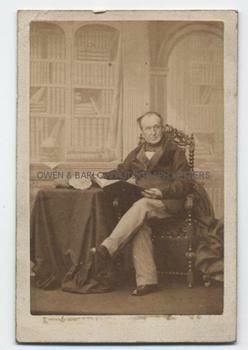 The photograph is a carte de visite circa 1860 and shows Roderick Murchison full-length, seated, with an open book and with geological specimens on a table. The autograph signature has mounting residue to verso but is else very good. The carte de visite photograph measures approx. 3.75 x 2.5 inches and is on the photographers original mount, with photographers printed details on verso. It is in near fine condition. Sir Roderick Murchison was one of the first to immerse himself in the new science of geology and was an early member of the Geological Society with Charles Darwin, Charles Lyell and William Buckland. He classified the Silurian system and was also instrumental in the classification of the Devonian system. Camille Silvy (1834-1810) was a French photographer active in London from 1859 to 1868. His sitters included members of the Royal Family, Harriet Martineau, Lord Palmerston and Adelina Patti. He suffered from manic depression and, following his return to France in 1868, he spent the remainder of his life in a sanatorium.